With so many new and exciting additions to Natal's catalogue including timbales, West African drums and cajons (not to mention Marshall's distribution strengths), the future for Natal seems rosier than ever. The Jim Marshall relationship harks back to the early days when he sold them from his London music shop and these Classics embody an awful lot about what made Alan Sharp's drums so popular in the first place. Superb professional sound. Lovely organic feel. A reliability that lets you fully express yourself without worry - or in this case a second mortgage! No protective rubber ring at the mouth of the congas - play carefully! It is perhaps fitting that the most iconic British amplifier makers, Marshall, are now in charge of Britain's best-known percussion company. 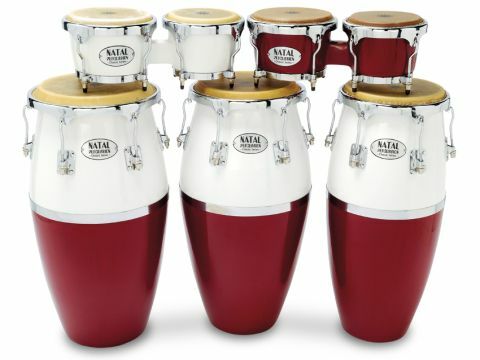 Natal percussion has been producing top-notch instruments since the mid-'60s and their original fibreglass congas were found on umpteen stages worldwide with groups such as Led Zeppelin, The Rolling Stones and Santana. Through frustration at not being able to get decent quality Afro-Cuban instruments over here, Natal founder Alan Sharp - who was a busy percussionist in London at the time - had an idea. He decided to source all the individual component parts and put together his own pro-quality percussion instruments. "These Classics embody an awful lot of what made Alan Sharp's original Natal drums so popular in the first place." The current day Natal Classic series are handmade in Thailand to the specifications of the original ground-breaking Natal fibreglass congas and bongos from the '60s. They come with chrome-plated steel hoops and hardware as apposed to cast aluminium (as with the 'high-end' Natal Cubana series) and a choice of four 're-issue' heritage finishes. Here we look at a set of three 30"-tall Classic congas with slightly scaled down 10" quinto, 11" conga and 12" tumba heads, as well as two examples of Classic bongos (with 7.5" and 8.5" playing surfaces). The steel hoops are different in design to Natal's über-comfy, low-mass aluminium cousins but are still low profile enough to prevent any hand-crunching problems. The tension plates and claws are virtually identical in shape to the Cubana congas, so the whole look is familiar but costs are much less. The insides of the drums are sealed with a light coat of grey paint over the fibreglass but there's no protective rubber ring at the mouth of the congas - so be careful when you play the 'lead' drum angled forward on a smooth surface. The bongos feature a cool uniform look with the block finished in the same colour as the two drums and, being fibreglass, they are comfortably light enough to play between the knees. The steel hoops and hardware on the bongos is reassuringly solid without trying to compete with the hernia-inducing oversized versions found on some other manufacturers' models. The 'dual' finish on the red/white Classic congas is possibly a matter of taste but there's a perfectly valid reason why we like 'em. Having owned a set of Natal's superb Cubana range for more years than we can possibly mention, we found that their wholly white finish has only ever developed scuffs and scrapes on the lower portion of the shells. This red/white option might well be more practical and mask any possible knocks. The congas bear more than a passing resemblance to the Cubana series and the sound is not too dissimilar either. The natural hide heads are responsive, comfy to play and look like they'll be more than durable too, although we'd also like to try them with synthetic heads, which we think could also be highly interesting. The drums' natural volume is much higher than found on comparative wood models so you will get more 'bang for your buck' in un-amplified settings. The slaps cut nicely through well-balanced mid tones and the bass tones definitely benefit from a boost in presence due to their fibreglass construction. The quinto in particular really reminded us of the Cubana version and is an impressive solo drum with great character and exceptionally comfortable even when laying in to it. The same must be said for the great value bongos with the hembra not too overly present and the macho cracking away but with beautifully clear finger and open tones. All of the drums are crisp and articulate and can be tuned quite broadly, providing a range of authentically musical tones that apply to most styles of music.